These chisels show exceptional craftsmanship and attention to detail. Smith Yoshiro Ikeda uses White Paper Steel for the edge, which is forge welded to a softer iron back for strength and toughness. The blade is ground on the bevel, and the edges, around the traditional hollow on the rear side. The rest of the chisel is left with the matt black finish from forging. Traditionally with Japanese chisels, the ferule would be installed on the handle before they can be struck with a hammer or mallet. While this is not difficult, it must be carefully done and takes some time. However, with these chisels, the ferule is hand-hammered and comes already fitted to the handle, which is in Japanese white oak. 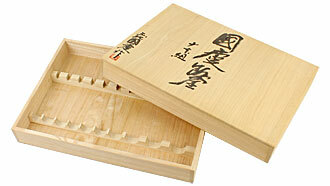 Thus, Kunikei chisels are ready to use after simply honing the bevel and the back of the blade. Blade made of "White Paper Steel", forge welded with softer iron. The handle is made of white oak and fitted with hammer-tone ring (Kazura). Made by master blacksmith Yoshiro Ikeda in Sanjo, Pref. Niigata. 3 mm Currently not in stock! 15 mm Currently not in stock! 18 mm Currently not in stock! 30 mm Currently not in stock! 42 mm Currently not in stock! 90 mm Currently not in stock! for 10 KUNIKEI chisels. Useful when you bought KUNIKEI chisels individually and you are looking for an adequate box. Chisel on picture NOT included!